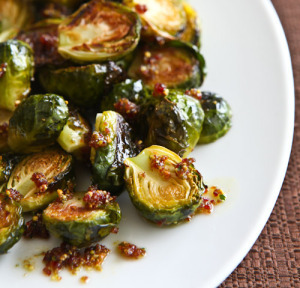 Bored with your same old brussle sprout recipe? Our friend Dr. Sarah Marshall, author of Food That Grows: A Practical Guide To Healthy Living With Whole Food Recipes, has a great, new recipe for you to try. Preheat oven to 400 degrees. Combine all ingredients in a large mixing bowl tossing in olive oil. Place on cookie sheet or in roasting pan. Roast for 30 minutes or until brussle sprouts are lightly browned. Try This: This recipe is the basic standard we use for all our vegetable roasting. Add root veggies, red bell peppers, broccoli, or cauliflower for more diversity and different flavors. Health Tip: Brussle sprouts are a Brassica vegetable in the mustard family (with cabbage, broccoli, cauliflower, and kale). These tasty vegetables are full of antioxidants like carotenoids and vitamin C and have anticancer properties. They are well known in nutritional medicine for the immune strengthening abilities as well.